From Indonesia with OM TELOLET OM. 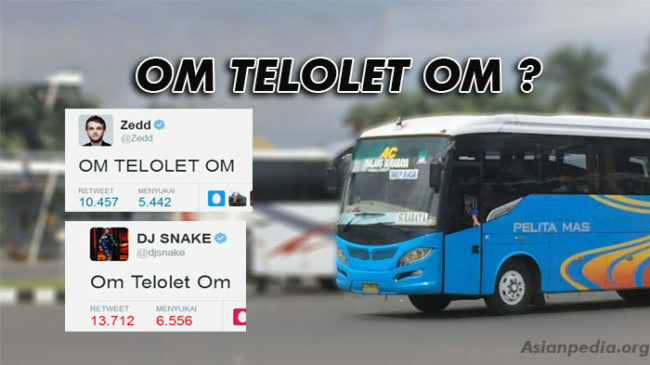 As we know, OM TELOLET has become a global event, it is very entertaining the users of social media. OM TELOLET OM has also created a new creativity in music, business and politics. Perhaps you know more about Bali than Indonesia. In fact, Bali is a beautiful island located in Indonesia. The location of this island lies between Java and Lombok. However, thanks to the "OM TELOLET OM", the name of Indonesia as a country now more famous than ever. Madness of OM TELOLET OM is originated from fad teenagers or young people in Java that screams "OM TELOLET OM" when the bus passed through their town. They asked the bus driver that pressing the horn button to sound out "TELOLET", which has now been internationally recognized. 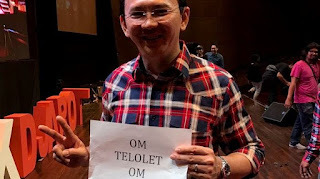 Om word meaning uncle, so the sentence can be translated OM OM TELOLET: Uncle please make sounds Telolet. OM TELOLET OM OM can be freely translated, that young people were asking uncle (the driver) bus to honk, so they heard TELOLET. You can say as "Uncle please press your klaxon". After that, they will be very happy and relieved after working or studying in the school. It has now been proven that in order to enjoy the happiness is very simple. Just say "OM TELOLET OM"
As a result of "TELOLET" This has aroused the creativity in areas such as music mix made famous DJs like DJ Snake by featuring Marshmello, and make the world entertained. President Obama also singing on his account, as well as sports celebrities, artists, and hundreds of millions of social media users. Are you one of them? If yes, then you are very lucky. Epidemics of TELOLET OM OM also impact on a business opportunity, even the world of campaign a candidate for governor in Jakarta, Indonesia. Candidates for governor, Basuki Tjahaja Purnama alias Ahok was photographed holding the paper with OM TELOLET OM, as well Sandiaga Uno, the challenger made a video by mimicking the action of OM TELOLET OM. Whether their behavior will attract the sympathy of new voters (swing voters or Undecided voters)? If you want to get a high-quality klaxon, you should go to Java and buy a klaxon with the most unique sounds. The craftsmen klaxon on the island is very skilled with this TELOLET business. All right, let's see a video compilation of this global event. If you care, let's share this information to anyone you know through your social media. A wise man said that it was wonderful variety that can be done by human beings.